Donald Trump has become the first US President to actively use his personal Twitter channel regardless of any US public diplomacy strategy, with a direct impact on the public policies defined by the US government and the White House. During 2017, Donald Trump’s personal Twitter channel –@realDonaldTrump– has been the main information resource chosen by the US President to generate opinion and sentiment on US civil society and has become the White House’s public diplomacy tool to have generated the most headlines in the media. Given this new political and diplomatic scenario, several issues have arisen that need to be considered to understand such a new phenomenon of political communication: is this Trump’s personal branding strategy? And does it affect US public diplomacy? 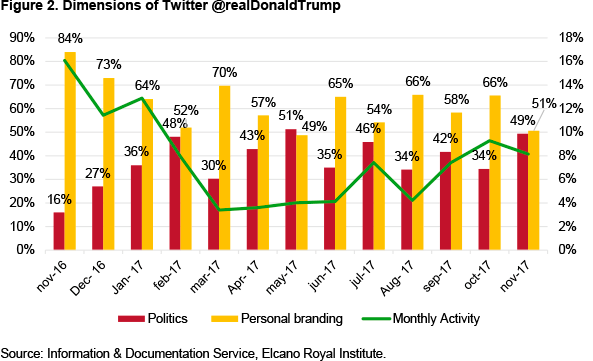 In order to obtain answers we have focused on the President’s personal Twitter channel to analyse the content of his activity and try to understand how US public diplomacy is affected by the Trump Brand. The Twitter channel @realDonaldTrump breeds uncertainty because Donald Trump is the first US President to fully communicate with the public in a personal manner, overturning the traditional models of political communication in terms of the formality of language and the frequent use of negative sentiment. This unexpected behaviour creates tensions both in internal and global politics. For this reason, it is interesting to know how his Twitter channel is integrated in US public diplomacy strategy, how the President interacts through it, how his practices have changed after his assumption of office and what networks are active throughout his period of activity. The goal is to determine how Trump uses Twitter as a political communication tool. Is this a personal branding strategy? Does it affect US public diplomacy? The working hypothesis is that President Trump uses the Twitter social network as an instrument that is not linked to the country’s public diplomacy strategy but as an element of his personal activity. This paper focuses on Donald Trump’s personal Twitter channel –@realDonaldTrump– in order to analyse the contents of his activity during the period ranging from November 2016 (when he won the presidential election) and November 2017; he made a total of 1.998 tweets that have set the tone, one way or another, of the political communication of his government staff throughout the past year. Secondly, the paper analyses the relations generated through the @realDonaldTrump Twitter network and the international outreach of these relations within US public diplomacy in order to understand the influence of Trump’s personal brand on each national public policy and especially on US foreign affairs. In order to undertake the analysis, we have attempted to measure the biases of Trump’s Twitter channel, distinguishing between ‘sentiment’ and ‘opinion mining’.1 An opinion is more of a person’s specific view about something, whereas a sentiment is more of a feeling. For instance, tweet 1, ‘Make America Great Again’ expresses a sentiment, whereas tweet 2 (shown in Figure 1), ‘CHAIN MIGRATION must end now! Some people come in, and they bring their whole family with them, who can be truly evil. NOT ACCEPTABLE!’, expresses an opinion. If someone says the first sentence in a conversation, we can respond by saying ‘I share/like your sentiment’, but for the second sentence we would normally say ‘I agree/disagree with you’. In order to understand how the President communicates sentiment and opinion we have divided his tweets into two groups; a political dimension where opinion prevails, and a personal branding dimension, which is generally filled with sentiment. Sixty-four percent of accounted tweets are linked directly to branding. Topics related with public policy and international relations do not exceed 38% of the total content of @realDonaldTrump. Both dimensions –politics and personal branding– are heavily juxtaposed but opinion and slogans predominate over political activity. Personal branding peaks from November 2016 to January 2017 (the US elections) and from September to October 2017 (UN speech, tax reform and Obamacare). Within both analysed dimensions, we have generated a thematic index of @realDonaldTrump content, generating an ad hoc taxonomy and relating each tweet to the type of language used by President Trump, with formal language understood as more neutral and akin to a public diplomacy context, and informal language understood as colloquial within public diplomacy. Make the President great again! Donald Trump’s Twitter activity during his first year as US President is, at times, overwhelming. 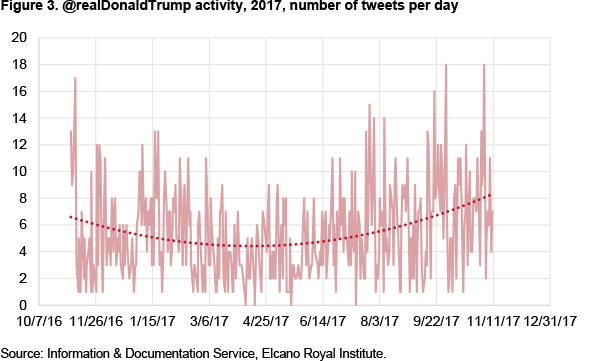 During the second half of September 2017, the Twitter channel @realDonaldTrump published a total of 143 tweets, which accounts for more than 9.5 tweets per day, 30 September recording the heaviest use, with 18 entries. This time period matches the Trump-Republican Tax Relief plan, heavy congress activity aimed at pushing through Health Bill reforms and the President’s criticism of the NFL on account of the attitude of certain football players regarding the national anthem. At the same time, President Trump wrote tweets about immigration and terrorism, remarks about North Korea and Iran and comments about his speech during the UN General Assembly meeting. We evaluated the weight of personal branding in @realDonaldTrump by comparing it against his strictly personal dimension and the political dimension of his character. In order to do so, we established limits between information that would classically be provided by a US President, with information that referenced his personal life, and a dimension specifically linked to the Trump brand, which lies beyond his personal or political presidential activity. Identity and personal branding are ever-present elements in Donald Trump’s public communication, and tweets designed to promote these values account for 71% of his output during the year analysed. In his personal branding dimension, tweets are usually supported by simple and direct slogans whose goal is to shape the marketing influence of the Trump Brand. These types of slogans intend to place the ‘us or them’ –those who agree with ‘making America great again’ vs those who are ‘opposed’ to the Trump brand and thus opposed to the notion of ‘making America great again’–. These messages emphasise a positive reinforcement towards ‘us’ and promote his image of a standard grassroots US without any ties to traditional power structures (a clearly anti-establishment stance). Aside from the already well-known ‘MAKE AMERICA GREAT AGAIN’ or ‘America First’ from his 2016 election campaign, there are new ones such as ‘BUY AMERICAN and HIRE AMERICAN!’ and ‘THE UNITED STATES IS OPEN FOR BUSINESS’. This slogan-heavy practice can be standard during an electoral campaign, but in Donald Trump’s case it permeates his entire public communication history and accounts for one fifth of his Tweets during 2017, giving the impression that President Trump continues to be immersed in the election process. Political tweets usually include opinions on policy, not only about the activities of Trump’s Administration but also criticism aimed at the political Administration of Barack Obama and Hillary Clinton. @realDonalTrump’s political dimension includes all the information that should be part of the government’s press releases and political discussion over issues in the public domain and of general interest is its goal. Under no circumstances is the US President using this channel in order to explain strategy or public policy. President Trump’s crusade against the mass media is understood as another element within his ongoing political campaign and personal branding, where the main goal is to relate media and political adversaries with Fake News. Furthermore, Fox News is linked to Trump branding and places itself at the forefront of political influence networks within US public diplomacy. Its place at the centre of the network (see Figure 5) makes it seem like another State department. Trump continues to make statements and produce personal opinions upon the presidential elections of 2016, by defending himself from fraud accusations and the supposed foreign aid received from Russia through the hacking scandal, and he seems to keep using an electoral campaign mindset represented by his political marketing Tweet activity, which amounts to more than 17% of his communicational output. Aside from his personal branding, most topics addressed by President Trump are related to public diplomacy and foreign policy, surprisingly paying less attention to topics like national security, immigration or energy. Health policy (Obamacare) and the Tax Reform are exceptions to these observations, but the President does not use his Twitter channel to explain these policies; rather, he uses it to acknowledge and publicly appreciate support or accuse political opponents. In Figure 4, the percentage for each topic is calculated on the basis of the total number of tweets analysed and, contrary to the personal branding dimension, which is a broader concept, personal branding topics include slogans and opinions on Donald Trump that he himself copies and pastes on his own tweets (no re-tweets). Journalistic media are fake news providers. The media are approached with a strongly negative sentiment accompanied by an informal language inappropriate for public diplomacy. Thereby there is a dialectic struggle with media such as the New York Times, the Washington Post and NBC. Public policies for the people. Within public policy, we include controversial topics in US policy such as immigration, education and tax reform. These topics seem to be generally approached with a straightforward and recriminatory language with the aim of reaching a less well-educated social group, in a style similar to a marketing campaign. The economy means US businesses. President Trump generally speaks about key topics such as the economy, the armed forces or his own government in a formal way while attempting to generate positive sentiment. 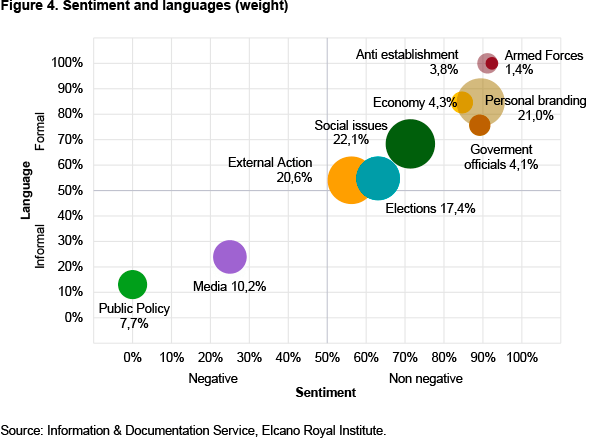 Additionally, every argument related to his anti-establishment discourse –such as anti-globalisation, the relocation of the economy or the perceived negative impact of the establishment on the personal and economic development of the average American– treated with a negative sentiment during the elections, is seen during 2017 to have been represented with a much more formal language style and a more positive sentiment. Foreign policy is more important than expected. Furthermore, foreign policy is treated directly and with a straightforward language where personal and political acknowledgments towards foreign state representatives are common. However, we can also see numerous sharp criticisms with a personal informal language towards political leaders from states such as North Korea and Iran. This is where we find a conflict between Donald Trump in his role as a disgruntled citizen and Donald Trump in his role as US President, as this particular activity accounts for 20% of the total and has significant international repercussions. Russia has a significant weight in these issues, which shows Donald Trump’s disposition to a positive relation with the Russian government. Once the biases with which most political headlines resulting from the White House’s public diplomacy are defined, we analyse the topics covered within the channel, differentiating between public policy, public diplomacy and a thematic array designed to shape and develop Donald Trump’s personal branding. It is necessary to understand what the dominant discourses are within the influence network that manages the digital diplomacy of the US government. The development of the influence network that is managed through Twitter generates relations that guide the strategies of communication and public diplomacy of the US government, and thus help expand these biases, ideas and personal branding associated with Donald Trump through every aspect of the White House’s digital diplomacy. But how does @realDonaldTrump influence the White House’s public diplomacy? Even if the US President considers his personal channel to be linked to the Trump Brand, what is the impact on US policy of his branding through @realDonaldTrump? The question is difficult to answer with only limited space available. However, as mentioned by Juan Luis Manfredi, Juan Sánchez-Giménez and Juan Pizarro,2 his influence is contextual and a more specific analysis can be undertaken with clearly defined influence networks. As noted by Akaev and Pantin,3 ‘the large-scale shifts in international politics since the beginning of the 2000s are being realized rather intensively and are likely to accelerate in the nearest future’, but the future is already here and ‘the results of these shifts may turn out to be rather different from how they are seen today by leaders of the leading powers and forecasted by many experts capable of influencing the key strategic decisions’. The problem arises when key strategic decisions are influenced by elements that are external to public diplomacy or traditional policy makers. In democracy and politics, the value of personal branding may distort a strategic decision. A quick glance at the network generated by @whitehouse shows the centrality of @realDonaldTrump and the weight it has on the US government’s public diplomacy network. As shown in Figure 5, @realDonaldTrump has a centrality and pagerank only comparable to @Potus, @Whitehouse and Vice-President Mike Pence’s Twitter channel. These four channels dominate a highly compartmentalised network and are referenced and mentioned in a high percentage of other official government channels. 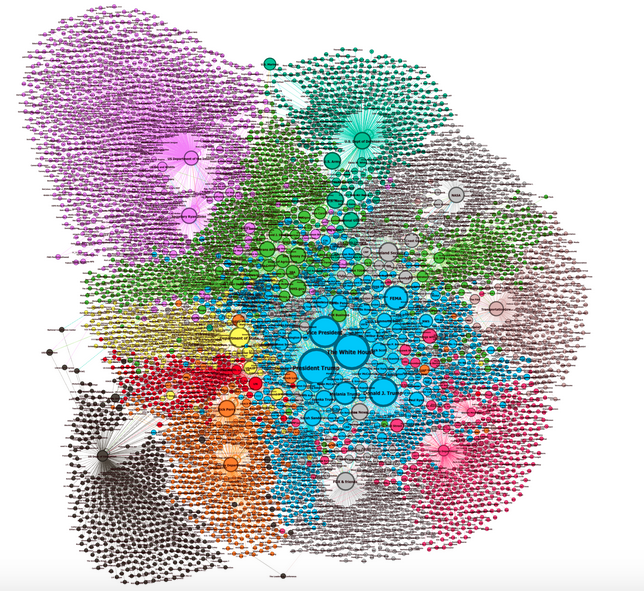 There is a high level of influence from @realDonaldTrump on important nodes in the network, such as Homeland Security (coloured light grey); the US Army and the Department of Defense (emerald green); the State Department (yellow), NASA (grey); the Department of Energy with its Secretary Rick Perry (orange); the Department of the Treasury (fuchsia); and the Department of Education (dark grey and less centred than other governmental departments). Secretary Ryan Zinke and the Department of the Interior (highlighted in purple) are relatively unimportant in the US government but very well connected within our network of influence. It is also important to highlight the position of Fox News throughout the entire network of US diplomacy. Fox News is the main media asset upon which Trump branding relies to grow and develop and has a significant presence within the content analysis of the @realDonaldTrump Twitter channel. Its situation within the network stands out because it behaves like another State Department within the influence network, very centred and close to all four main information nodes. President Trump uses Twitter as an element of personal activity. In practice, there is no difference in the President’s messages before and after being elected. He mainly focuses on domestic issues in a partisan way, reinforcing his voting base. When tweeting about foreign policy he has no institutional strategy to improve American public diplomacy. Ultimately, public diplomacy is a tool to achieve foreign policy goals not merely an instrument for self-promotion or advertising. Trump appears to feel like an observer of the international arena, and not a leading actor. That explains his negative feelings and unconventional ideas about Russia, Mexico, Qatar, the UK or the London attacks; ‘unconventional’ in this case meaning not in accordance with traditional US diplomacy. Herein lies the novelty: while breaking up with media intermediaries and deinstitutionalising public diplomacy, Trump is sending a direct message, not promoting diplomatic negotiations. One-way and directly confrontational messages are not the way to promote dialogue, a key issue in public diplomacy. The President’s behaviour does not add value to US public diplomacy in the social media. His hyper-leadership attitude is accelerated by the instantaneousness of Twitter, it erodes social capital and reduces both trust and intercultural communication. He overshadows all other foreign policy actors by diminishing the weight of intelligence from the diplomatic community. In summary, Donald Trump’s social media use is frivolous, overturning traditional wisdom and judgment in his presidential statements. He jumps from crisis to crisis, using a colloquial style in delivering messages instead of providing solid content. He is breaking the rules and that is only good for the political communication community. 1. Federico Pozzi, Elisabetta Fersini, Enza Messina et. al. (2017), ‘Challenges of sentiment analysis in social networks: an overview’, en Sentiment Analysis in Social Networks, Elsevier, Amsterdam, http://dx.doi.org/10.1016/B978-0-12-804412-4.00001-2. 2. Juan Luis Manfredi-Sánchez, Juan Antonio Sánchez-Giménez & Juan Pizarro-Miranda (2015), ‘Structural analysis to measure the influence of think tanks’ networks in the digital era’, The Hague Journal of Democracy, nº 10, pp. 363-395, doi 10.1163/1871191X-12341320. 3. Askar Akaev & Vladimir Pantin (2014), ‘Technological innovations and future shifts in international politics’, International Studies Quarterly, doi: 10.1111/isqu.12124, pp. 872.